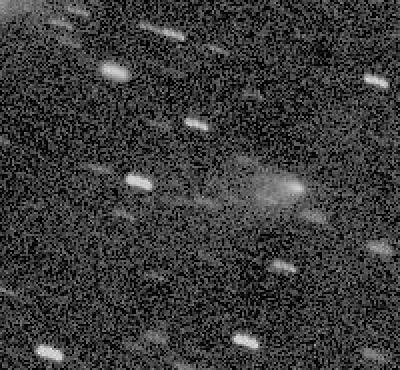 This image of Comet C/1998 QP54 (LONEOS-Tucker) was obtained on 1998 December 14 with Spacewatch. The image is 3.5 by 3.2 arcminutes on a side with north at the top and west on the right. This image is the result of co-adding 3 consecutive images of the comet, shifting each to align the comet itself. The comet is slightly right of center with a broad fan-shaped tail extending at least 0.8 arcminutes to the left, from position angle about 70 degrees to about 120 degrees. Click on the thumbnail for the full view of the comet.